The line from sharp with the least features for 2012 is the LE440U line. This is the only line that will be produced in smaller sizes and has many of Sharp's features such as Aquos Advantage live support help from Sharp, Smart TV options, an updated design with beveled top and bottom edges of the black plastic frame (made to look like brushed aluminum but its plastic). It also contains a very thin bezel width on sides at .75". It is not a Sharp Quattron with only 3 color RGB not Quattron. 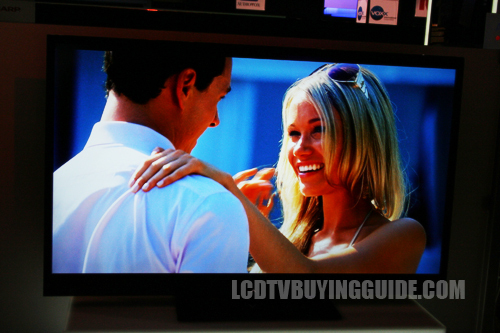 The Sharp LC-32LE440U LCD TV (backlit with LED lighting) has a great picture quality but does require some calibration out of the box as colors may seem a little over saturated especially in the Vivid Dynamic picture mode. One thing that I like about it is the ability to have two custom settings – one for maybe movies and one for broadcast or cable TV programming. They will look very different on this huge TV. What we recommend is turning up the backlight setting, and if you're in a brighter room you will definitely want to tune the Brightness setting up some as well to provide for better dark shadow detail. Though Sharp is consistently getting better at developing its Auto mode which senses room light and adjusts the picture accordingly, we still recommend leaving this feature off due to some flicker effects in the picture. Side angle viewing on the LC-32LE440U was slightly hazy as we noticed a loss of contrast from around 20 degrees off center. The LE440U is an attractive television, the beveled edges on the top and bottom of the .75" bezel are made to look like brushed aluminum for a refined appearance.